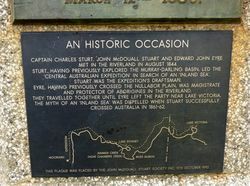 A monument commemorates the centenary of the European discovery of Lake Bonney by Joseph Hawdon and Charles Bonney in 1838. 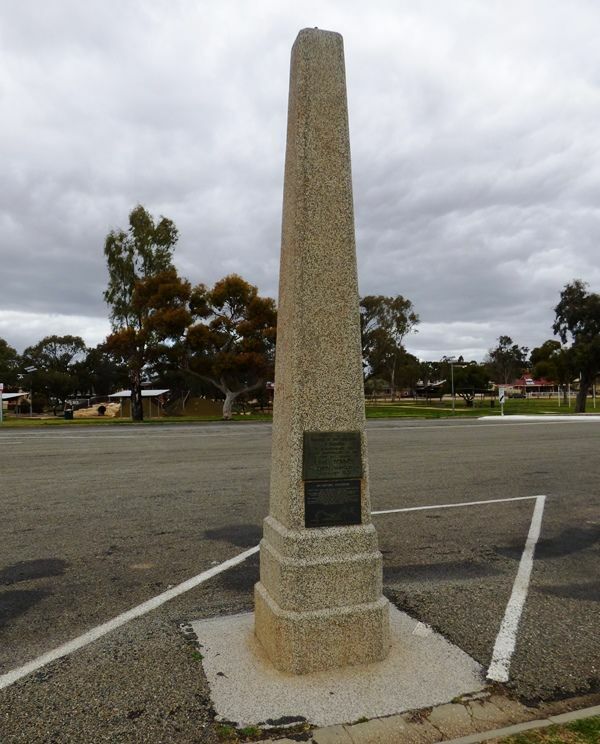 At the end of 1837 the newly-established South Australian settlement was threatened with famine, and Hawdon, who had returned to New South Wales, with Charles Bonney, drove 300 head of cattle from the Goulburn district to Adelaide, where they arrived on 3 April 1838. They camped on the shores of Lake Bonney, which Hawdon named after his companion. 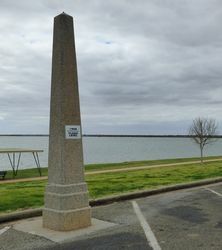 The obelisk that the Barmera Tourist and Publicity Bureau has decided to erect to mark the hundredth anniversary of the discovery of Lake Bonney by Joseph Hawdon will be unveiled on Saturday, March 12, at 3.30 p.m. A great deal of interest in the anniversary celebrations has been shown by the Royal Geographical Society in Adelaide, and it will be represented at the ceremony. 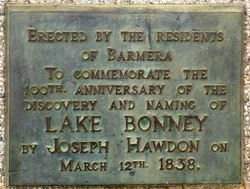 A bronze plate will have the following fitting words in scribed on it: "Erected by the residents of Barmera to commemorate the hundredth anniversary of the Discovery of Lake Bonney by Joseph Hawdon, on March 12, 1838." Murray Pioneer and Australian River Record (Renmark, SA), 24 February 1938. Joseph Hawdon was one of our greatest explorers, and his feat in bringing cattle from Albury to Adelaide in the was one of the droving exploits in Australian history, said Mr. Sam Mclntosh at Barmera on Saturday afternoon, when he unveiled a memorial obelisk to commemorate the discovery of Lake Bonney 100 years ago that day by Hawdon's overland party. The Advertiser (Adelaide, SA), 14 March 1938. To commemorate the 100th anniversary of the discovery and naming of Lake Bonney by Joseph Hawdon on March 12th 1838.